Just How Big A Deal Is Mayweather’s IRS Problem? Probably Not Very. On July 7th, Bryan Koenig penned an article in “Law360” claiming that Floyd Mayweather doesn’t have money to pay off taxes he owes from 2015 – at least not on hand. Needless to say, the combat sports world took the news and ran with it. It was hard for a fight fan to slip through his or her Twitter feed without reading some wise crack or other about the situation (full disclosure – I quipped about the matter myself). Just how big a deal is Mayweather’s IRS problem, however? Honestly, probably not very. Floyd’s run up against the IRS before, remember. The situation itself doesn’t appear to be overly complicated, at least not on the surface of things. In short, Floyd owes the government money. And while he has plenty of green, not all of it is readily available. As Robert W. Wood states in “Forbes,” Mayweather “is worth plenty, of course, but having high value assets doesn’t always translate to cash to pay the IRS. And that seems to be Mayweather’s problem.” Long story short, Mayweather wants some extra time to get some cash together before he pays off the tax man. He’s got a big fight coming against Conor McGregor on August 26th, after all. Still, Wood makes it clear that the IRS isn’t always agreeable to that type of argument when cash may be easier to come by than it seems. Indeed, the IRS might feel this is the case with Mayweather. It would make sense, then, that Floyd has taken the most hated institution in America to court. 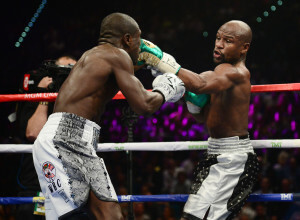 As Wood puts it, “Mayweather has probably played his cards with the IRS just fine.” Why? Because by the time all the legal dust settles, the McGregor fight may be over and done and Floyd will have tons of money to give to Uncle Sam. After all, it’s said the man called “Money” will probably earn at least 100 million against the Irish MMA star. How Floyd got into this and other tax situations is frankly out of this writer’s field of expertise. When all is said and done, though, Mayweather’s most recent tax problems may not amount to more than a nuisance. The famously loud and brash McGregor may use them as a weapon at this week’s press conferences, but – knowing Floyd – the boisterous McGregor may trouble him about as much as Uncle Sam does. And, honestly, that doesn’t seem to be very much.